Gustavus Adolphus College President Jack Ohle is pleased to announce that Dr. James Patrick Miller will join the faculty in September 2014 as the inaugural holder of the Douglas Nimmo Endowed Professor of the Gustavus Wind Orchestra. This new professorship was established by Raymond ’51 and Lorraine Lundquist in honor of Dr. Douglas Nimmo, the Gustavus Wind Orchestra’s longtime conductor. Miller currently serves as Assistant Professor and Director of Wind Studies at the University of Massachusetts in Amherst, where he conducts the wind ensemble, symphony band, and teaches graduate and undergraduate conducting. His work at UMass Amherst has quickly gained Miller national attention as a conductor and music educator. Under Miller’s leadership the UMass wind bands have twice appeared at the College Band Directors National Association Eastern Division conference, commissioned, premiered, and recorded new works, hosted nationally renowned guest conductors, soloists, and composers, and frequently toured to public schools throughout the Northeast for education outreach programs. 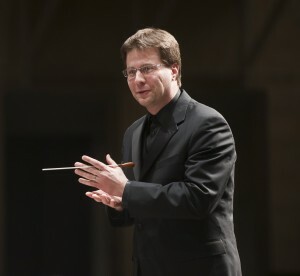 In 2003, Miller received national recognition by winning the American Choral Directors Association National Conducting Competition at the graduate level and throughout his career has been in equal demand as a choral conductor, working diligently to promote a holistic study of the art of conducting from both choral and instrumental perspectives. Prior to his appointment at UMass Amherst, Miller served as a visiting assistant professor and interim conductor of the Gustavus and Vasa Wind Orchestras during the 2008-09 academic year. He also previously held positions at the University of Minnesota and Cornell University. Miller holds a doctor of musical arts degree in conducting from the University of Minnesota, a master of music degree in conducting from Ithaca College, and a bachelor of music education degree from St. Olaf College. The Nimmo Professorship is the seventh endowed faculty position established by Gustavus since the College’s strategic planning process, Commission Gustavus 150, was approved by the Board of Trustees in 2010 with a goal of establishing ten new endowed professorships by the fall of 2015. Nimmo has served as conductor of the Gustavus Wind Orchestra since 1987 and is retiring at the end of the 2013-14 academic year. “The Gustavus Wind Orchestra now begins a new era. Placing James in this position is perhaps the most fitting way to honor both Doug Nimmo’s legacy and Ray and Lorraine’s generosity,” Moore said.